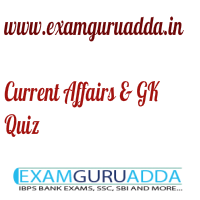 Dear Readers Examguruadda.in presents Current Affairs quiz of 3-4 September 2016 that cover important current affair events. Current Affairs quiz prepared according to the latest Bank, SSC and other competitive exams. 1. Name the Action movie star, writer, director who will be given an honorary Oscar for his extraordinary achievements in the movies? 2. Who was recently appointed as President of Gabon? 3. Islam Karimov, who recently passed away, was the President of which country? 4. What was the theme of the International Literacy Day 2016? 5. Which village became the first Wi-fi hotspot village in Haryana? 6. The 2016 G-20 Summit has held in which country? 7. Which state government has launched Biju Kanya Ratna Yojana for the development of girls? 8. Who has been appointed as brand ambassador for anti- liquor & anti-drug campaign by the Kerala Government? 9. The first-ever Nomad Film Festival has started in which city? 10. Pranaav Jerry Chopra is associated with which sports?